As usual I’m sitting around the house thinking about freediving. I think about planning dives in the near future, I research new possible spots using Google Earth, the California Coastal Records Project as well as the California Coastal Access Guide. I think about apnea training and taking further skills development courses, like the Performance Freediving International Advanced Course. I think about new dive gear I might like to buy, carbon fiber fins, underwater cameras, etc. 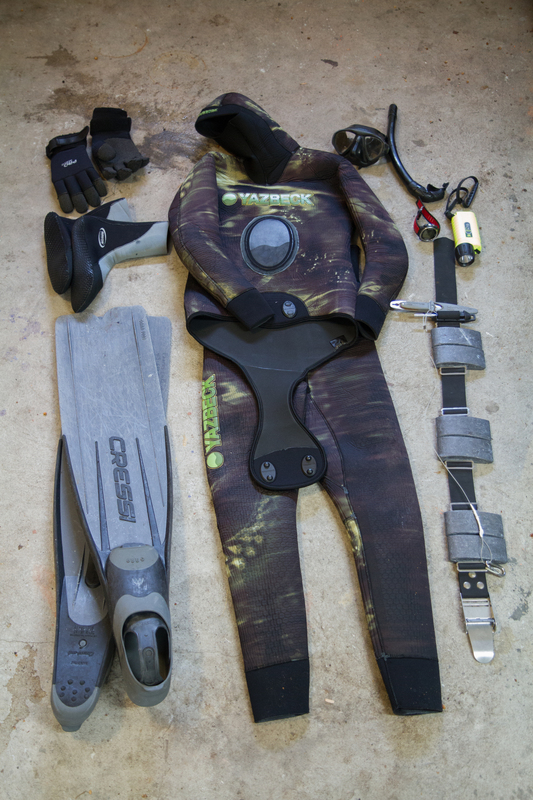 I also think about minimizing the gear I do have so I can enjoy more streamlined and less burdened diving. Anyway, I thought I would put together a checklist for the things I take Spearfishing/Abalone Diving, this checklist isn’t so much for me but rather to help out newer divers by giving them an idea about what to bring, of course I also do enjoy writing on the subject of diving. I wear a Yazbeck Kelp Stalker freedive suit with a built in hood, it’s open cell, flexible and warm. I have a plastic bottle of watered down hair conditioner I use to lubricate my open cell suit before I slip it on. Lubricating your suit prevents tearing your suit and struggling to get it on. I use 5mm Kevlar lined dive gloves by pro mate. I don’t love the way they fit or their durability. I’m still looking for a pair of gloves I can truly love. You can get by with 3mm, but 5mm are definitely warmer. I really like the fit and durability of my Argos and the warmest they come is 4mm, my feet don’t really get very cold in general. I wear 15 pounds of wedge weights clipped into place (they are more streamlined and more comfortable), I also keep a small stringer designed specifically to be worn on the belt, finally I have a small dive knife I use to slit the gills of bigger fish and to cut myself free should I ever become entangled on braided line. A brief note on dive knives, they don’t need to be big they should also be kept somewhere accessible and streamlined like the front of your weight belt or towards your inner thigh. I dive with a pair of Cressi Gara 3000s, they are lower cost composite plastic freedive fins. I have had mine for a few years and I have beaten the hell out of them. I would like to upgrade to either carbon fiber or fiberglass but I will likely still keep these guys for when I go shore diving (you don’t want to crack a fragile carbon fiber blade while trying to exit a tide pool). If you’re freediving with scuba fins, great, that’s what I started with. Update: I now have a pair of Salvimar foot pockets with soft fiberglass Leaderfin blades, I like the pockets but I’m still undecided on the blades I think they may be too soft and when kicking up from deeper depths I find my cadence is much faster than I would like. These little pieces of rubber are not critical to a dive, but if your fins are at all loose they help keep them in place. With a mask small is better, obviously it has got to fit your face, but less air volume means less wasted air from your lungs equalizing that volume at depth. Aqualung makes a $50 mask (the Sphera) that has a wide range of view and is very popular with freedivers, it’s less popular with spearfishers because it has plastic lenses that distort visual perception more significantly than tempered glass. I prefer glass. As for the snorkel I have some cheap and short Cressi snorkel I bought on Amazon. Their is nothing fancy or complex about my snorkel and I love it. When diving it is advised that one spit the snorkel from their mouth for potential safety reasons. A smaller snorkel has less drag and is less likely to be an inconvenience. Personally, I prefer to to tape my snorkel to my mask’s strap in the position I like, I have lost too many snorkels when the drag from water or a stalk of kelp ripped it free from the clip, electrical tape is cheap and your snorkel is always where you need it. This isn’t really a necessity for diving but it definitely has enriched by diving experience. I like knowing how deep, how long, and how frequent my drops are during a day of diving. Clearly you need an Ab Iron when you dive for abalone, they are also quite handy to have in case you come across a rock scallop. I always have an iron with me when I’m diving because scallops are rare and very very tasty. I hunt with a polespear and I don’t know much about spearguns so I won’t give advice about them. I predominantly use a 6′ or 7′ Gat-Ku aluminum/carbon fiber polespear with a flopper tip when I hunt for bigger fish and a paralyzer tip when I hunt smaller fish. 6′ is a good size for working holes on the ocean floor and pulling fish out. 7′ or 8′ is nice for fish beneath the canopy in the water column. 9′ or 10′ is needed for longer shots on larger pelagic fish, something I don’t have much experience with and generally more commonly hunted in Southern California. I find a flopper tip to be the most reliable in securing a speared fish, it also produces the greatest damage to the fish and often tears up the flesh. The paralyzer tip, or 3 prong, tends to stun fish and also does the least damage to the meat. The slip tip also does little damage to the meat but it occasionally fails to engage and it is also time consuming to remove and replace, but it is the only tip that can be rigged with a breakaway setup that can be used to target big pelagic fish. Polespears also come in a variety of materials usually either fiberglass, aluminum, or part aluminum part carbon fiber. Fiberglass polespears are cheap, inaccurate, and not a good value. Looking in deep dark little holes beneath boulders is essential to finding big fish, you need a flashlight. It’s good to have a solid stringer to secure big fish to your kayak or float. I no longer use a metal stringer, after an unfortunate event where my metal stringer opened up and large lingcod was lost I now only use a more traditional mono line stringer. The mono line stringer is a little less convenient for carrying your fish out after a dive, but it does a much better job securing fish and you don’t risk fish falling free from your stringer when you add fish to the stinger. One important point is that with larger fish such as big lings running the stringer through the gills may not be a secure enough placement, on the biggest fish I go through the eyes. A hawg trough is not absolutely necessary but some form of measuring device is (even if its just a piece of string with carefully spaced knots). Lingcod, Cabezon, and Greenling all have minimum sizes 22″, 15″, and 12″ if you should shoot something questionable you need to know that its of legal size, at the same time since a speared fish often times has its fate written its important not to waste a legal sized fish you’ve likely killed, for the shorts trust that something else will eat it. I have a water proof case for my cell phone that allows me to use my phone as a GPS when out on the water. If you find a really good hole or perhaps an interesting cave and you want to find it again a GPS is a great way to do that. I keep my fishing license, ab card, pens, zip ties, Afrin, Dramamine, and Sudafed in a bright orange Nalgene bottle, it floats, it’s highly visible, and it’s water tight. Got to have a way to keep your catch fresh until you can clean it. 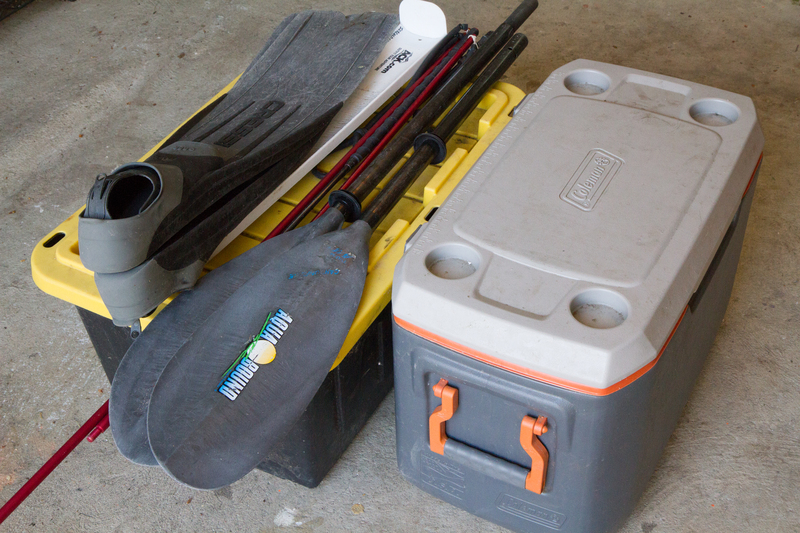 I have a large plastic storage bin for all my dive gear I bought at Home Depot. It makes it easy to keep my car clean, to keep everything in one place, and to wash my gear after a dive. I should note that I’m always very careful to make sure that my weight belt is at the bottom of the bin and that my neoprene is on top. Leaving a weight belt on top of high quality neoprene is an easy way to compress and ruin a wetsuit. You don’t want to lose a paddle while diving, and when you get in and out of a kayak all day long you can bet you’ve got a chance of it falling out. Also its nice just to toss your paddle out of the yak when you get to a spot and not have to worry or have it in your way. I have an anchor, I rarely use it. I made a kelp clip for less than $10 at Home Depot. I bought 10′ of bungee cord, a bronze quick clip, and a plastic squeeze clamp. 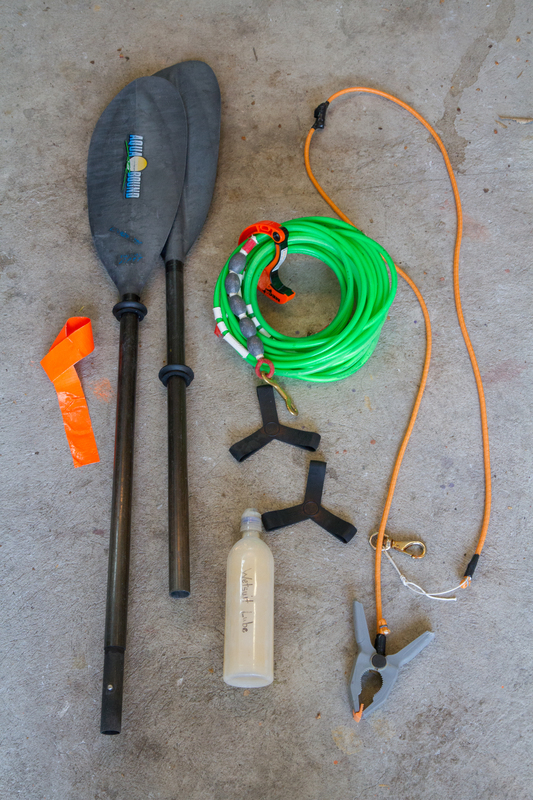 I clip one end of the bungee to my boat and when I get to my spot I use the squeeze clamp to grab a kelp stalk. The bungee helps ease the force of the swell as the kayak pulls on the plant. I have a boogie board I have rigged up with shoulder straps and bungees for carrying my gear down to the beach, boogie board are more hydrodynamic then ab floats and lots of guys prefer them. Banks Boards are basically the same concept except made from hard plastic and fairly expensive. I may end up getting one but I would like to rig up a second even more awesome dive board. Both the float and the board also provide extra buoyancy for when you need to rest or prop yourself up to vomit out in the water, hehehe. Since you don’t have the hold or the hatches of a sit on top kayak it’s nice to have a catch bag with you to deal with urchin, scallops, octopus or abalone when you’re out in the water. We already covered why I always bring one anyway, but if you’re going ab diving its a must. Although I have taken several abs by hand. You are legally required to have a 7″ ab gauge in your possession when harvesting abalone. I use a 9″ gauge because I won’t take anything less. 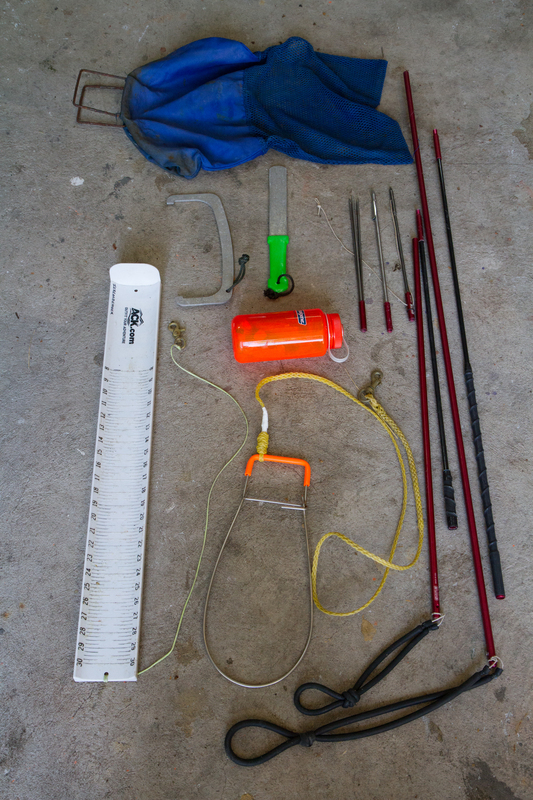 Most spearfishers use these with their guns all the time, I don’t like how the line interferes with my polespear and I only use one when diving for abalone. It’s a long hollow brightly colored polyvinyl tube with a clip on one end for my iron and a gauge. When you find something and you run out of breath you can go up recuperate and follow your line back down. Some guys don’t use them at all and as your skills increase your sense of underwater orientation increases as well. Float lines are great for beginners and still pretty helpful for more experienced guys. *Denotes things not necessary for those who don’t intend to hunt or harvest. After a long day diving I brought home a few red sea urchins and ate them for dinner. Urchin “roe”, more accurately labeled urchin gonad, is a popular delicacy in sushi restaurants, it shows up under the name of uni and the price is usually set at M.P. aka expensive. To the uninitiated with a standard western palette uni, when served, is usually considered at best unappetizing. To those with an open mind who take the time to develop a taste for this unique flavor uni is not only delicious but quite literally intoxicating. The gonad of the red sea urchin, as well other species of urchin, contains a chemical known as anandamide. Anandamide acts upon the brain’s cannabinoid receptors, if one eats enough Uni they can become intoxicated in a manner similar to having consumed marijuana. The question remains, how much Uni must one consume to get high? And that remains a subject for your personal experimentation or for another of my posts. When preparing Uni for dinner, it is always best to start with the freshest possible urchin. If you live on the western side of the Americas then you have access to both purple urchin and red urchin. Purple urchin can be found in intertidal zones, they are smaller, less prized, and easily harvested at low tide while keeping one’s clothes dry. Red Urchin are the most sought after, they are much larger, and they are usually found in deeper waters within kelp forests. I often times take several red urchin when I dive for abalone on the north coast of California, they make for an easily prepared and delicious dinner when I get home. Step 1: Start with a fresh red urchin, preferably alive and still wiggling, with a large knife crack the echinoderm in half. Step 2: Dump out the Urchin’s stomach contents and then use a spoon to carefully scrape along the inside of the shell freeing the bright gold “roe”. Place the 5 gonads of the urchin into a bowl of salt water. Step 3: Gently remove any filaments attached to the roe and rinse off any left over undigested kelp, take the cleaned pieces out and place them on a plate lined with a paper towel, let them dry a little, then serve them over rice and wrapped in seaweed, dip them in soy mixed with wasabi. On days when I don’t have the time to drive to dive sites in Monterey or Sonoma, or on occasions when I feel the need to trap dungeness crab. I sometimes dive at a site close to San Francisco, the crabbing is good when its in season and the diving is worse than mediocre. However, there is one thing I can always find in quantity when diving at this spot, lead fishing sinkers. The underwater structure is awful and although I have had terrible luck hunting fish it seems everyday that fisherman casting from the jetty snag their fishing weights along the rocky seafloor and the weights break free. When I go crabbing for the day I will drop my traps in the sandy area where the dungies like to be and then paddle my way over to the area where the fisherman lose their sinkers. In only a few hours of freediving and collecting handful after handful of abandoned fishing sinkers I can load my kayak with well over 100 pounds of discarded lead. Once I decide my kayak can’t handle anymore I make my way back to my traps and collect my crabs before heading in. The visibility is usually terrible, 2-3 feet, and the swell can be quite forcible, but at the end of the day I come home with a bucket of lead, at least a few dungeness crab, and I have gotten in some good freediving practice. When I get home and after I have cleaned my dive gear and put away my crabbing equipment I set about smelting my lead and casting dive weights to be sold on Craigslist. The items needed to do this are fairly basic they are a dutch oven, a propane burner, a stainless steel spatula, a stainless steel ladle, weight molds, welding leathers or thick burn resistant clothing, face protection, welding gloves, some rags and a bucket of water. Lets be clear about some of the safety hazards at risk here. Molten lead is about 600 degrees Fahrenheit, it will scar you badly, face protection is a must. The fumes from smelting lead are bad, don’t breathe them and don’t smelt lead indoors. Finally the most important thing you can do to prevent molten lead from splattering in all directions is to be careful to make sure your utensils are dry when you dip them into the molten metal. Here is how it works, I place the dutch oven on the burner and fill it with lead sinkers. I ignite the burner and leave it to heat up for about 20-30 minutes. When I come back, the molten lead has sunk to the bottom and the calcified crust of the old sinkers is left floating on top. With all my protective gear in place I use a DRY spatula to scrape off the crust of impurities. I place the crud on a board or on the dirt and allow it to cool before I throw it away. With my weight molds and my water bucket handy I take a DRY ladle and scoop out 4-5 pounds of molten lead. Quickly I pour the entirety of the ladle into a DRY weight mold. It is important the weight be cast in a single pour, the molten metal cools quickly and for a solid lead weight it must be done in a single fluid pour. Once poured I fill up a few more weight molds, this goes much quicker with a couple extra molds, and I allow them to cool for a few minutes before plunging the molds into the bucket of water. I take the molds out of the water and strike each mold a few times against a brick to free my shiny new dive weights. At this point I use a rag and thoroughly dry the weight molds. I take the lid off my dutch oven and I scrape off the thin layer of black crud that forms when the molten lead reacts with the air. I then repeat the process and pour more weights until I’m out of molten lead. I don’t have a great method for measuring out exact weights, I mostly just eyeball a mark on the mold. When I’m done I use a kitchen scale to measure the weights down to the tenth of an ounce. The entire process takes a little over an hour. I enjoy freediving, even in murky conditions for scrap. I feel good about removing lead from the ocean. When I post the weights on craigslist or bring them to dive events I have little problem selling the weights for 2$ per pound. Its nice to think that in a half day on the coast near San Francisco I can come home with several dinners worth of prized dungeness crab and a few hundred dollars worth of scrap metal.